It looks like the Google Home isn't the only Google product on sale today. 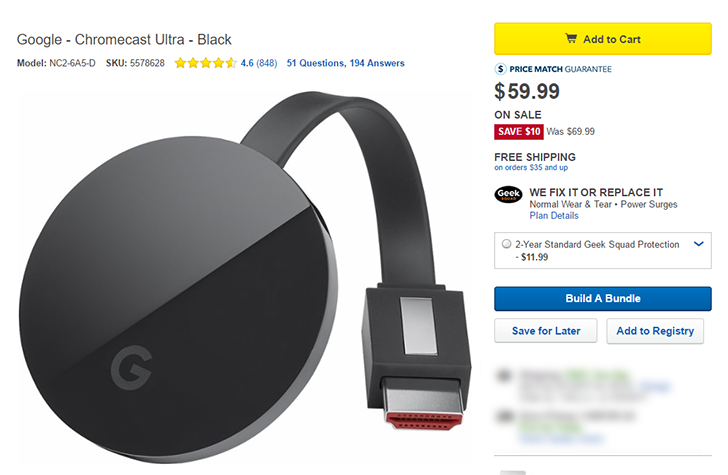 We have yet to see a widespread discount on the Chromecast Ultra since it was released last year, until today. Now you can pick one up for $10 off the normal price at several physical and online retailers. If you need a refresher, the Chromecast Ultra is a step up from the second-generation Chromecast, with support for 4K video playback. It can also play HDR/Dolby Vision content, as long as you have a compatible TV. The Ultra also ships with an Ethernet adapter, in case your wireless network isn't quite enough to stream that high quality video. You can find links to all the retailers selling the discounted Ultra below. Let us know in the comments if you spot any more stores discounting it. It's also worth mentioning that the 2nd gen Chromecast and the Chromecast Audio are both $5 off as well. Weekend poll: How many photos are synced to your Google Photos account?